On our first morning in Hong Kong we were awake quite early and were eating breakfast in the hotel’s 2nd floor restaurant soon after it opened. The selection wasn’t as extensive as at the Manila Sofitel but it was quite adequate for our needs. Our first task on leaving the hotel was to purchase two Octopus Cards at HK$50 each from the nearby North Point MTR station. We then loaded them with a further HK$100 each. Please note that these transactions can only be carried out using cash. Fully equipped with our travel cards, we took the escalators down to the platform level and caught an Island Line train along to Central station. From there, it was just a short walk across to the adjacent Exchange Bus Station where we caught a No.15 bus up to The Peak. We have usually taken a ride on the iconic Peak Tram, something I would highly recommend doing for first time visitors to Hong Kong. Queues for the tram can be long so it’s a good idea to aim to arrive first thing in the morning to avoid wasting time. Taking the bus to the top of The Peak is quite a thrill in itself, especially if like us, you manage to secure the front seats on the upper deck. From this elevated position passengers can take in the dramatic views as the bus twists and turns its way up the steep hill. The air was slightly cooler at the summit and we stretched our legs by taking the circular walk (Morning Trail) around The Peak. 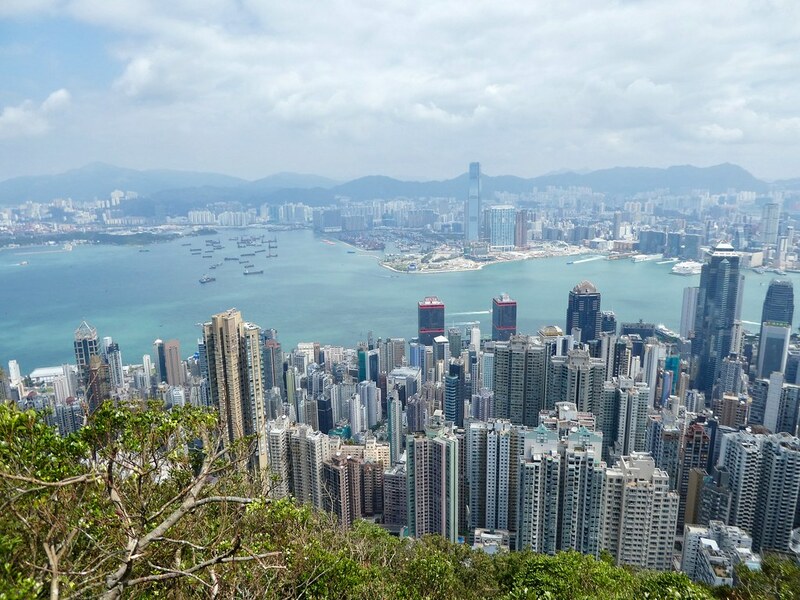 This 3.5km gentle walk winds its way around the highest point of Hong Kong Island offering breathtaking views at every turn. The trail is signposted and runs from Lugard Road to Harleck Road and can be taken in either direction. Most visitors just take in the views from the outlook points close to the tram station but if you can spare the tine I think you would enjoy following this trail. Wandering along the paths beneath the tropical vegetation there was much evidence of the recent typhoon with numerous uprooted trees and broken branches. 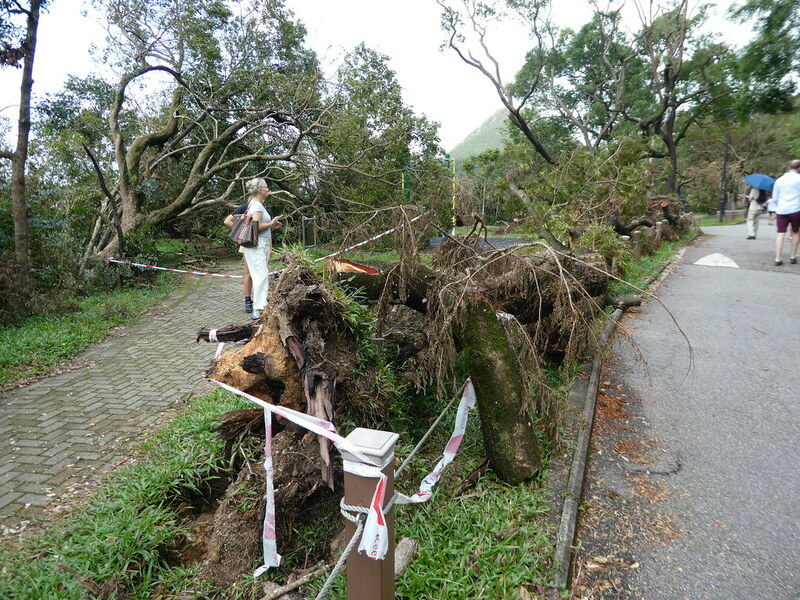 Huge efforts had been made to clear the paths but debris was piled up at the roadside awaiting chopping and collection. On completing the trail it had been our plan to relax with coffees on the terrace of the Galleria shopping centre but we discovered that this was closed for refurbishment until summer 2019. Instead, we took the bus back down the hill to its terminus near the Star Ferry terminal. 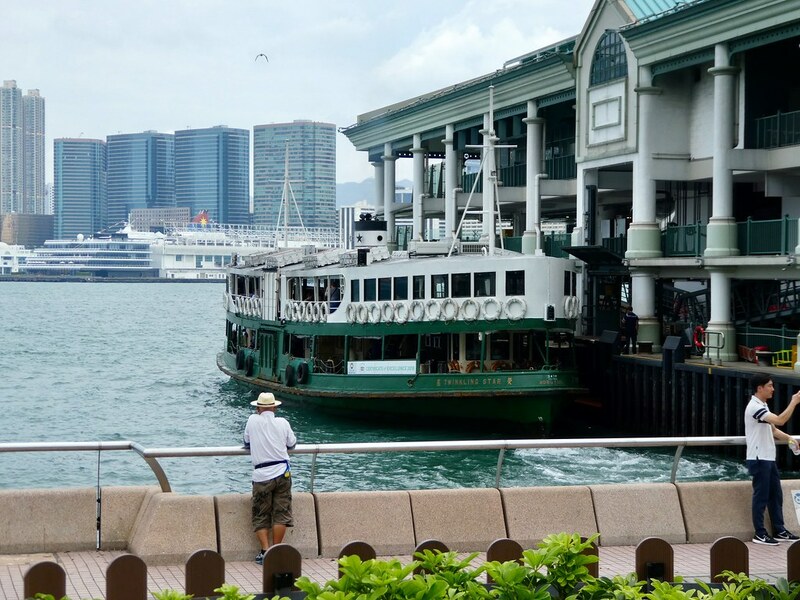 No visit to Hong Kong can be complete without a ride across Victoria harbour on the iconic Star Ferry. We boarded a ferry across to Kowloon sitting on the upper deck where tickets cost only HK$2.20 (21p). The ferry terminal is in Tsim Sha Tsui and across the road from there on Canton Road stands Heritage 1881 a handsome Victorian colonial building. 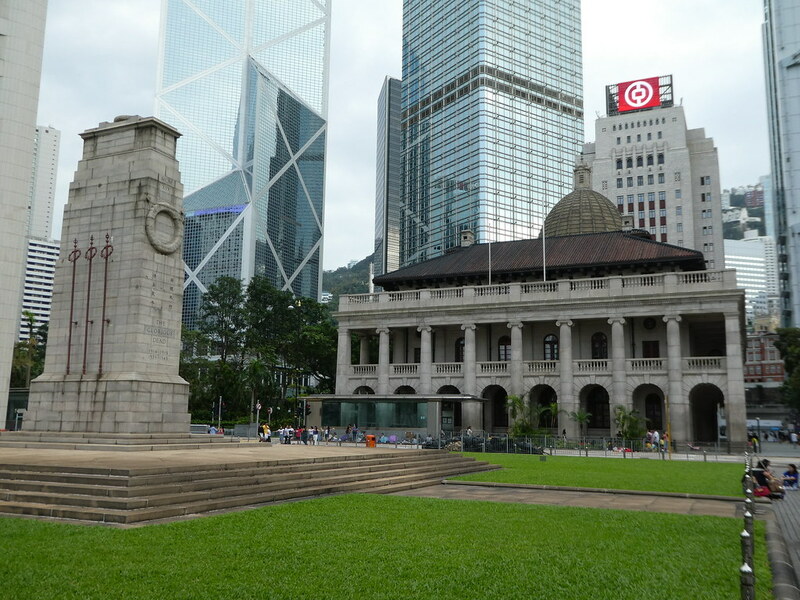 Between 1881-1966 this was the headquarters of the Hong Kong Police. 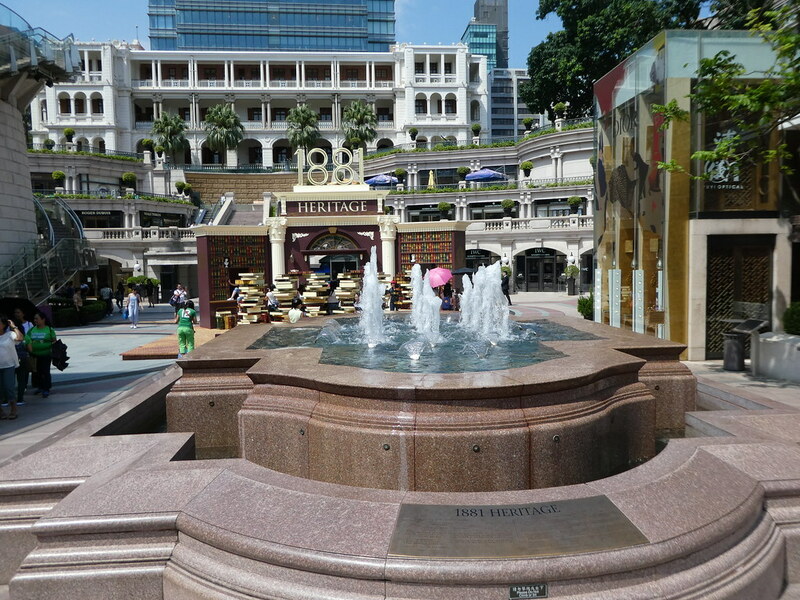 Several of the buildings have been restored and now feature an upmarket shopping mall, heritage hotel and an exhibition hall. 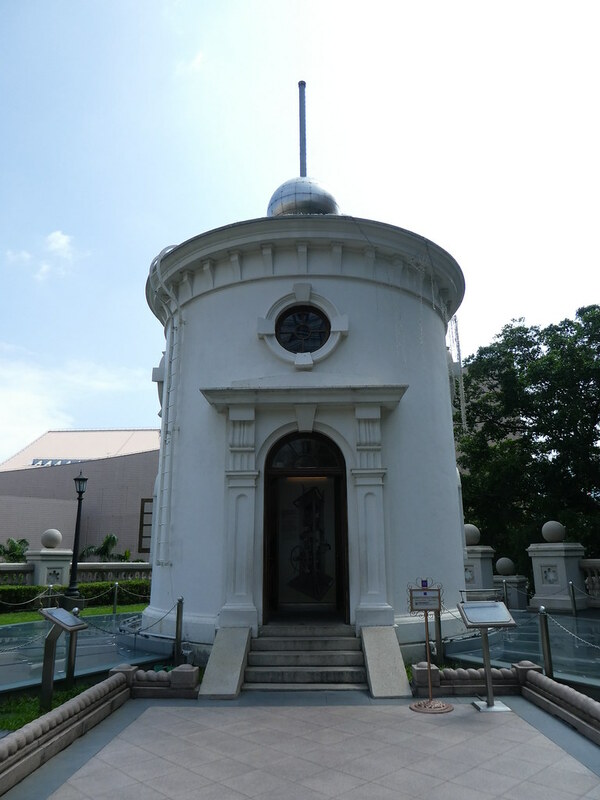 The most interesting monument on the Heritage 1881 site is the Time Ball Tower. Between 1885-1907 this provided a vital service to ships in Victoria Harbour. The ball mounted on the pole in this tower was raised each morning and dropped at 1.00 p.m. each day to allow ships to recalibrate their chronometers. We then glanced in some shops along the bustling Nathan Road passing the famous Chungking Mansions on our way. 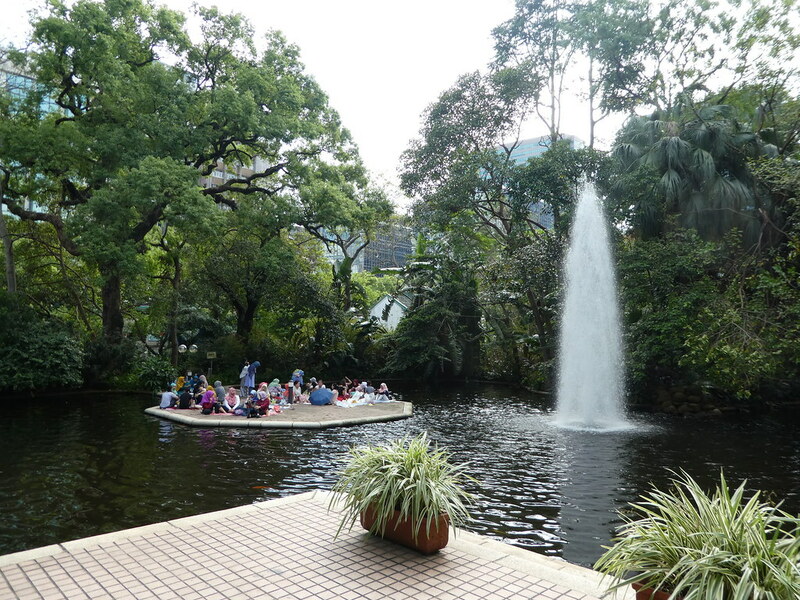 Our walk then took us to the nearby Kowloon Park which is an oasis of green in the heart of Tsim Sha Tsui. The park was crowded as it was a public holiday in Hong Kong (Mid-Autumn Festival) and hundreds of Filipino and Indonesian maids were making the most of their free time enjoying picnics with their friends. 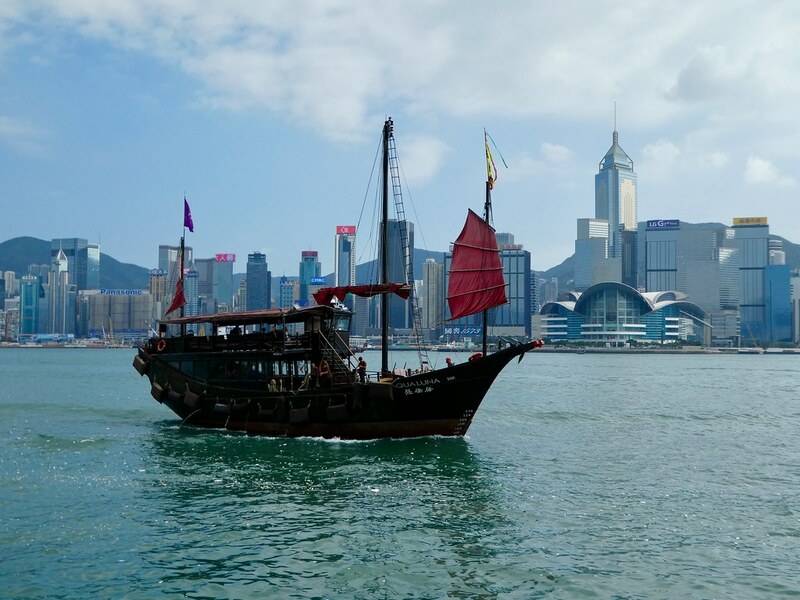 Moving on, we slowly made our way back to the Tsim Sha Tsui waterfront where we paused to take in the stunning harbour views and to watch the junk, Aqua Luna with its bright red sails return to the quay. 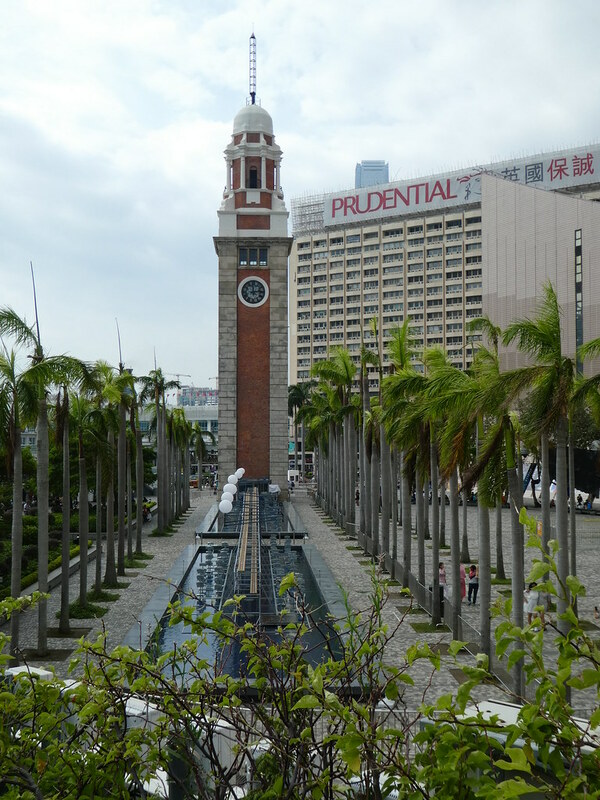 Next, we climbed the steps onto the viewing platform near to the clock tower which is the only surviving building of Kowloon railway station. It didn’t take much tempting for us to choose to return to Central by Star Ferry rather than using the metro through the cross harbour tunnel. Near the Star Ferry terminal stands the gleaming International Finance Centre (IFC) mall where we rested our legs with a late lunchtime snack before taking a look around some of its shops. From there it was just a short walk to Statue Square with its cenotaph which is a replica of the one in Whitehall, London. The elegant colonial, former Supreme Court building, now the Court of Final Appeal, dominates the square. Here we found hundreds more maids, huddled in small groups with their friends making the most of their extra day’s holiday. We glanced in several more shops and even popped into Marks & Spencer’s for a brief look round but didn’t buy anything. 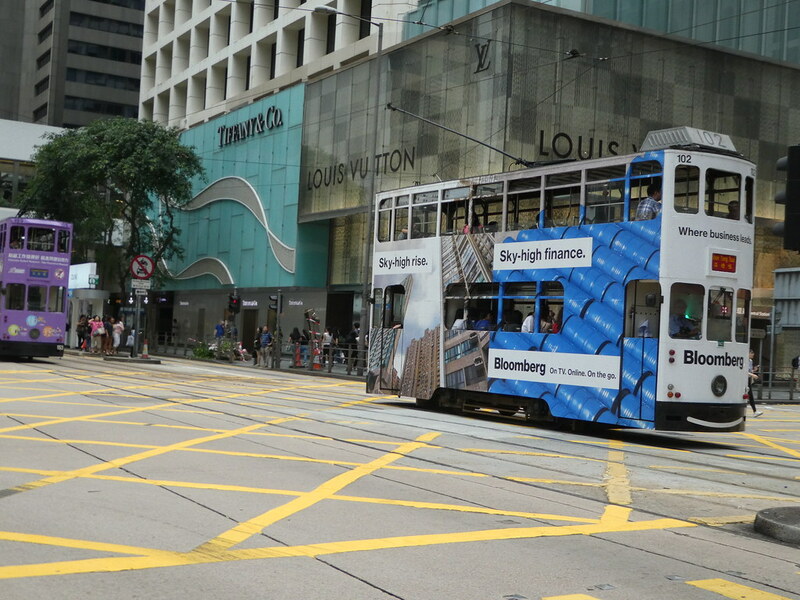 We then caught one of the lovely old trams back to North Point which are affectionately known as ‘Ding-Dings’. Passengers board at the rear and pay on exiting at the front. Trams have a flat rate fare of HK$2.60 (25p) irrespective of length of journey and are an inexpensive method of travel on Hong Kong Island. Our favourite seats are on the upper deck, either at the back or front from where passengers have aerial views of the bustling streets and neon lights below. Back at the hotel we had a short rest before going out for a meal to a small, family run restaurant that we had eaten at on previous visits to Hong Kong. We recognised some of the staff and our large portions of pork with ginger and pineapple and sweet and sour chicken were delicious and very filling. 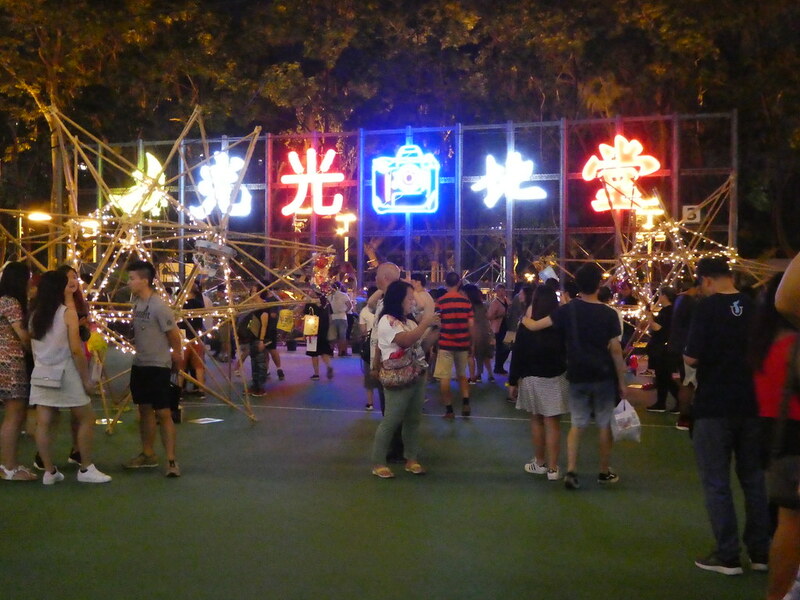 After we had finished our meal we strolled along the road, passing through Fortress Hill to Tin Hao as we’d read that the Tai Hang Fire Dragon Mid-Autumn Festival was taking place that evening. On reaching Tin Hao it wasn’t a problem knowing which way to go as we just followed hundreds of people heading to the square where the festival was taking place. It was impossible to see anything from the square as it was already overflowing with spectators so we moved on and by chance found a better vantage point where we were able to have uninterrupted views of the Fire Dragon procession. 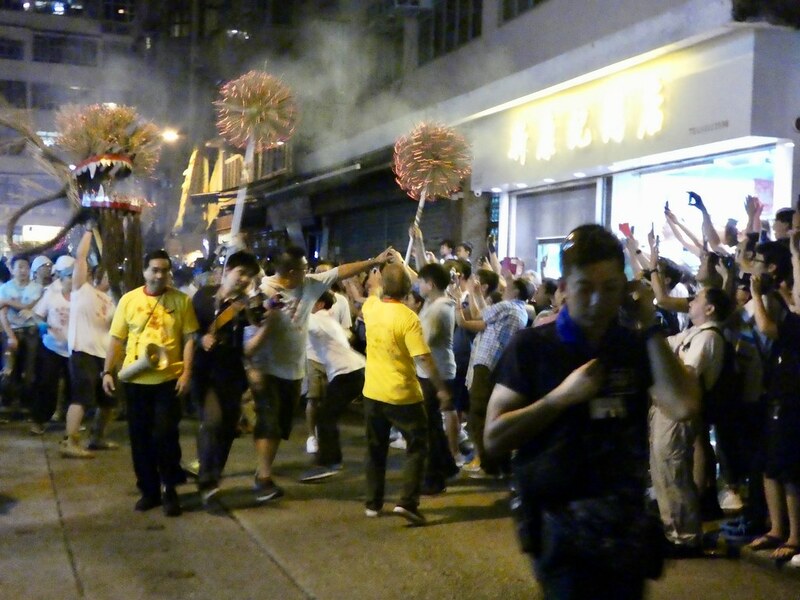 I had never seen anything like it before, as a massive 67m (220 ft) straw, stuffed dragon wound its way through the narrow streets, carried by 300 volunteers and accompanied by the sounds of roaring drums, firecrackers and dance performances. 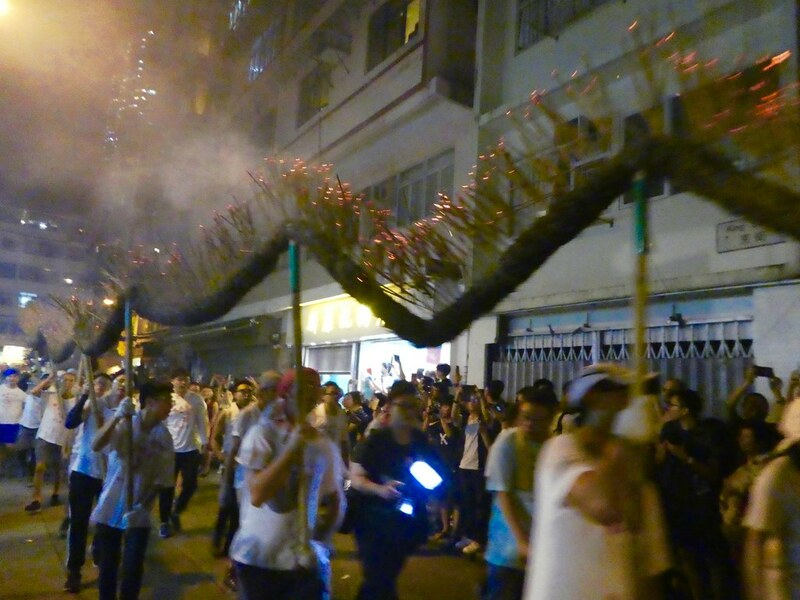 The Fire Dragon Festival takes place annually as part of a century old tradition, under the light of a full moon during the mid-autumn festival. The dragon is made from straw and covered with 70,000 incense sticks which are lit and carried by local residents. The head of the dragon weighs 70 kilograms and is formed by wrapping straw around a rattan frame. As the dragon approached, we could see that it was shaking its head in front of doorways to bring good luck and health to the residents. This ritual is thought to have started in 1880 after the village of Tai Hang was hit by a typhoon followed by a plague. Afterwards we slowly followed the crowds into Victoria Park where a display of lanterns looked pretty, illuminating the night sky. We then caught a tram back to North Point and reflected on what a lovely first day we had experienced on our return to delightful Hong Kong. 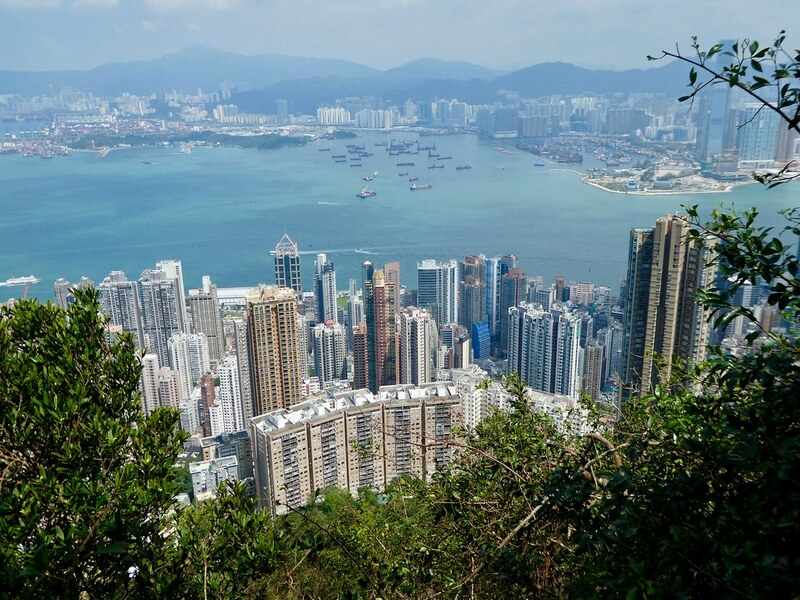 The first time I visited Hong Kong my friends suggested I take the loop walk around the top of Victoria Peak as I had a free morning and afternoon before my flight left late in the day. I got halfway around, enjoying the marvelous views, when suddenly the skies opened with a sudden summer downpour. In moments I was soaked to the skin (actually, I felt I was wetter than I had been in some swimming pools!) I hurried around the remainder of the loop, hid in the loo while I wrung out my clothes, then dripped my way back to my friends house for a plastic bag and a change of clothes before heading for the airport. Moral – always carry an umbrella in Hong Kong! Oh dear, the rain can come down very heavily and with little warning. I always carry a small umbrella in my bag, just in case! Thanks for your much appreciated thoughts, they are most welcome Allyson. Thank you for your kind words, your comments are much appreciated. I live in China, but Hong Kong hasn’t really been on my must-see list. Oh do try and visit Hong Kong, you will love it! The Fire Dragon festival looks dramatic, Marion! As are those views, of course 🙂 🙂 Lucky you! Thank you Jo! It was just a coincidence that we were in Hong Kong when the Fire Dragon Festival was taking place but I’m so pleased we got to experience it! 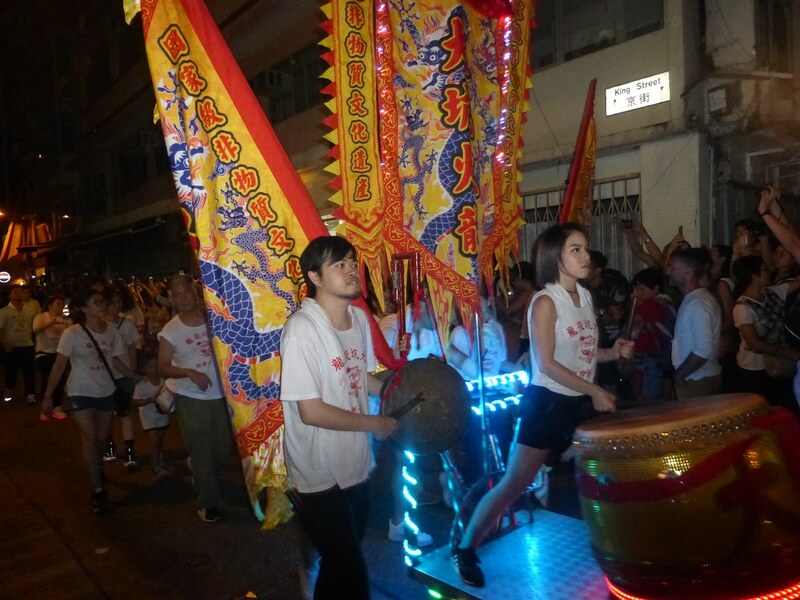 The Fire Dragon Festival was incredible, I’m not sure it would be allowed here though with our strict Health & Safety regulations, though it was safely led through the narrow streets. Yeah, we do have a habit of going a bit over the top at times! All the more reason to travel and enjoy these kind of experiences I suppose! Thank you for your ever welcome thoughts on this series of posts. The old boat (Junk) and the narrow trams are my favourites. 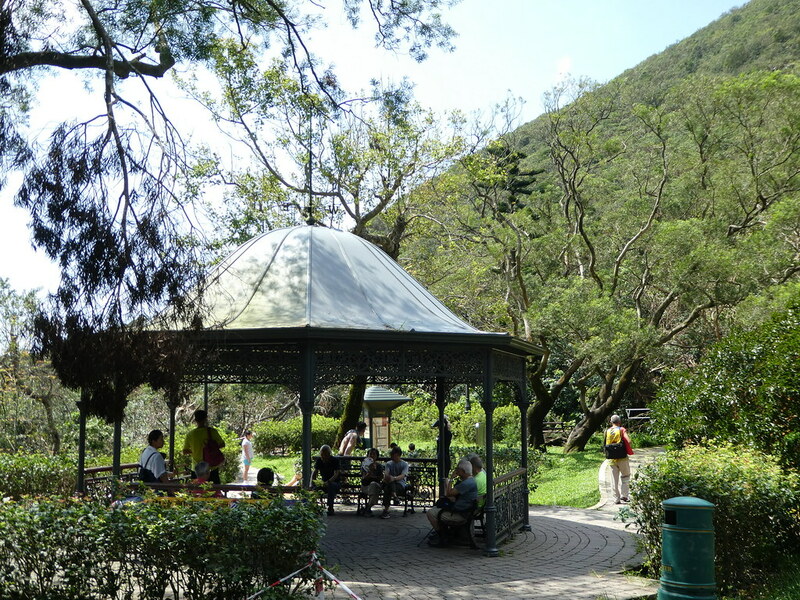 I always enjoy taking a walk around The Peak and watching people practice Tai Chi near the pavilions. Loved following you through HK Island and Kowloon Marion. I worked with the HK Police for six months and we went out very late one night to Chungking Mansions to do some work – very interesting place and interesting people!! PS I just love both the Star Ferry and the Tram – icons of HK. How fascinating that you went out with the HK Police to Chunking Mansions one night, that must have been an unforgettable experience! I love riding the old trams and the Star Ferry and would never tire of a visit to Hong Kong. Thanks for your ever welcome thoughts Sue. Thanks for the trip down Memory Lane. Richard and I went to Hong Kong as a wedding trip many years ago. We stayed at the Peninsula Hotel. For a day’s outing we rented a car and drove to the border – that was an adventure. Some sights have not changed. How wonderful to stay at the Peninsula Hotel, it must have been an unforgettable wedding trip. 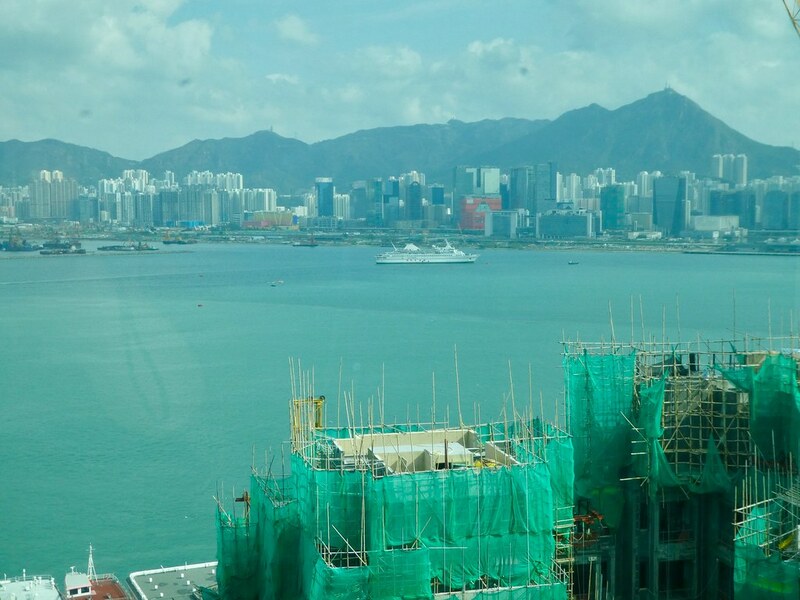 I think it is awful that they built in front of the hotel and it no longer enjoys the spectacular views of Victoria Harbour from the majority of floors. I love Hong Kong. It has evolved from being the place to buy electronics and other things cheap to a major business centre in the world. I used to visit a Chinese industrialist who had a home on The Peak in which his sons and daughters lived with their families too. They had a collection of very expensive cars. I went to college with two of his daughters. They eventually sold out and moved to Canada. The view from up there is spectacular. It’s fascinating to read about your visits to Hong Kong Ian. The Peak is still one of the most exclusive districts. It was my sixth visit to Hong Kong and I could return anytime, I enjoy visiting there so much. Amazing! I should visit Hong Kong I’m geographically close to it, thank you for the insight! Thank you for your much appreciated comments. I hope you have an opportunity to visit Hong Kong soon. Beautiful photos! HK is on my bucket list now. Thank you,hope you get a chance to visit Hong Kong soon! 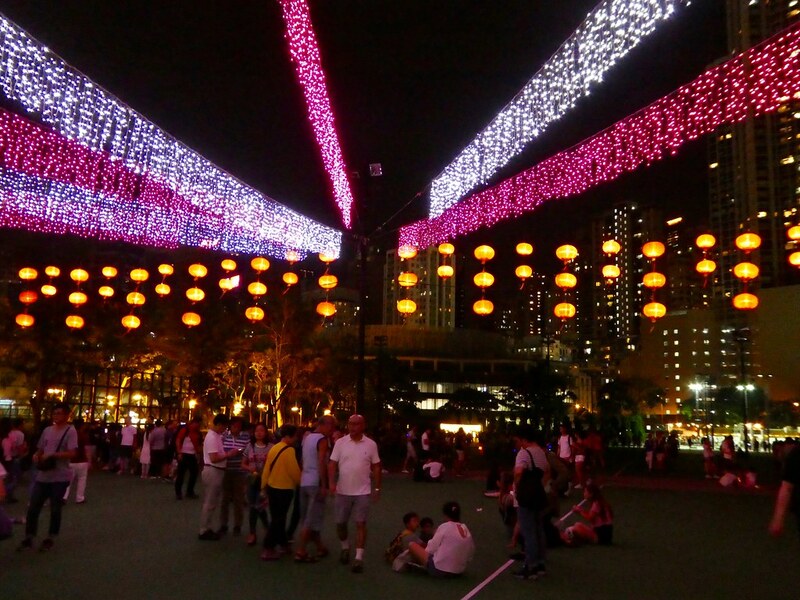 great blog, I loved Hong Kong and Manila, tell me did you get to visit any other Islands in the Philippines? I got down as far as Boracay Island… one of the cleanest islands I have ever seen.. Thank you for your kind words Stephen. On this trip we only visited Manila but I would like to return sometime and visit some of the smaller islands including Boracay. Enjoy blogging, it’s really fun and it’s an opportunity to interact with so many like minded people! It looks like a beautiful and fun place to visit. You sure do pack a lot into a day! Thank you for your kind words. Hong Kong is a beautiful place to visit and I can never tire of returning there. Hi, I’ve managed to join you – in a manner of speaking – in Hong Kong. It looks much more tempting than I imagined it….I take more pleasure from ‘photo/armchair travel’ now my legs won’t allow me to walk too far…I’m not sad as we’ve done our fair share of travelling over the years, and my husband (while mentally 40) is now 90…He still drives like Stirling Moss…shops and cooks, but long walks are out. As a writer, I get plenty of exercise (more of the mind…) May you have good health for many years to come and continue following you heart, and your feet! Best wishes. x. Thank you Joy for your welcome thoughts. It’s lovely to read that you are continuing to enjoy my blog posts. Wishing warm greetings to yourself and your husband, Marion. Thank you Timothy for taking an interest in this post. I think you would enjoy a return visit and be able to notice some changes. Thank You showing modern HK. We have not been there, but I have watched many old films in which I saw how it was long time age. I enjoyed every photo and I felt like being with You thru Your gorgeous photos. Thank You. Thank you for your kind words. It’s so nice to read that you will soon be visiting Hong Kong yourself. You will love it! Wonderful post my sister has been to Hong Kong I can’t wait to go. Thank you so much for your kind words. I do hope that you get an opportunity to visit Hong Kong soon! What awesome photos–thanks for sharing! It’s my pleasure, it’s so nice to read you enjoyed viewing them. Thank you so much for your kind words. It’s good to know that my photos have brought back happy memories for you.